Defends against hostile forces. He also appears to use No Land Beyond, the exotic primary sniper rifle from Destiny. "The Cabal are bringing in a fortified Mining Lander, I believe this means a resource grab." Devrim Kay VIII is a human scout in the European Dead Zone, helping to aid the Guardians in their recovery efforts. As a member of the City Militia, he has a lot of experience fighting the enemies of humanity. He is an old friend of Suraya Hawthorne and the husband of Marc. Devrim provides missions for Guardians to undertake in his church outpost within the Trostland. He is something of a linguist, prone to going on long tangents about City and Fallen dialects if given the opportunity, and is fond of tea. Devrim manufactures many of the survivor's weapons, such as the Scathelocke. His weapons tend to be simpler than the City's weapons, made from what appear to be pre-Golden Age weapons tech. Devrim joined The Last City's militia forces to help protect the wall alongside the Guardians of the Vanguard. He also took an interest in a rebellious young woman named Suraya Hawthorne. The two became friends, and he bailed her out of multiple assault charges. After the fall of the Last City to the Cabal's Red Legion, Devrim worked with Suraya to gather refugees at The Farm in the European Dead Zone. He served the refugee forces as a scout, taking up a sniping position in the ruined city of Trostland at the top of an old church. There, he was visited by The Young Wolf and explained to them he needed aid setting up a communications network powerful enough to let refugees know about the Farm and that the first step was clearing out some of the Fallen in the area. He directed the Guardian to supplies and signs around the area, including a Hunter's mark indicating the basement of the church was dangerous. As the Young Wolf went below, Devrim remarked that the history of the region was fascinating and that the tunnels they were entering stretched all across the Dead Zone. After the Guardian killed Skexsis, Outcast Captain, he congratulated them and asked them to return to him. When they arrived, Devrim gave them a comm signal booster to take to Hawthorne, who had gone to the top of a nearby mountain to place a signal transmitter for their communications network. First, Hawthorne wanted the Young Wolf to plant signal boosters in other areas of the EDZ. When the planting of the first one drew more Fallen to Trostland, Devrim suspected that killing Skexsis may have angered the House of Dusk. As the Guardian proceeded to place the second beacon, Devrim took issue with Hawthorne describing the Last City as a prison, despite her criminal exploits there. After the second beacon was placed, Hawthorne told Devrim there was feedback on the comms channel, and he realized the Fallen had set up jamming beacons. Once the jammers were destroyed, Devrim reported the signal was clear. Hawthorne then asked the Young Wolf to get some nearby supplies she had abandoned, and Devrim questioned why she had abandoned supplies for the Farm, but she informed him that she had gathered it for the City before it fell. However, the Fallen had already arrived, and once they were cleared out Devrim warned they would soon return in force for the supplies. Thankfully, the Young Wolf drove them off once more, and Devrim thanked them on behalf of himself and Hawthorne before asking them to return soon to continue their mission. Before the Young Wolf could return, the Fallen began jamming the signal again. Devrim speculated that the Fallen were angry that they had lost the opportunity to take over the EDZ when the Young Wolf regained their Light from the Shard of the Traveler and were trying to take revenge by blocking the signal. Tracing the signal to the underground tunnels, Devrim guessed the Fallen were hiding there to avoid the Red Legion's patrols of the region. The Young Wolf infiltrated the Fallen's hideout and destroyed their broadcasting equipment, which would prevent the Fallen from jamming the signal again. Hawthorne requested that Devrim bring the signal booster to her on the top of the mountain, but he protested that the Young Wolf would take it to her and that he was too old to keep cleaning up her messes. She mocked him for admitting to being old and jokingly said that bailing her out once did not mean he could always lord it over her, but he noted he had done it more than once and that she was the reason his hair was gray. As the Young Wolf made their way through the Fallen infested salt mines, Devrim warned them the Fallen would put up a big fight to protect their territory. However, the Young Wolf ended up driving many of the Fallen from the mine shaft, and Devrim watched as they fled the area. When the Guardian reached the top of the mountain, Devrim was surprised to hear Hawthorne thank the Guardian and tell them they were not bad, and he told the Young Wolf that was the nicest thing he had ever heard her say to someone. Although the comms network was finished, the Farm and its defenses were dealt a blow when the Young Wolf decided to depart for Titan and join Commander Zavala's resistance there. Before the Young Wolf departed, they agreed to help Devrim with a plan he made to trick the Red Legion and Fallen into fighting each other for awhile instead of attacking the refugees. They planned on using intercepted Fallen transmission to craft a message to lure the Red Legion in for an ambush at the cliffside above the salt mines, and Devrim warned them that while there was now a teleporter they could use to get up there, the Fallen had rigged the mine with explosives after the Young Wolf's last assault. Taking advantage of this, the Young Wolf transmatted the explosives to use in the ambush, which Devrim approved of. While setting up the ambush, the Ghost mentioned that he would use a House of Devils accent for the bait. Devrim began to explain what really fascinated him about that accent, but the Ghost cut him off and suggested keeping the channel clear for the ambush. They sent a message insulting Ghaul, and the Red Legion dispatched many drop pods to the cliffside. After the Cabal team was wiped out, Devrim noted he could hear the explosions from the church and that the Fallen and Red Legion would no doubt soon be at each other's throats. "Death binds us all together, whoever we are - Guardians and non-Guardians alike. Now, what say we pour one out for our old friend, eh?" A year after the start of the Red War, the Last City suffered another loss when Cayde-6 was murdered by Prince Uldren Sov of the Reef and his Scorn allies. When news of this loss reached the Farm, Devrim watched as the settlement came to a standstill due to the Guardians shock at the loss of the Hunter vanguard. The next time the Young Wolf visited Devrim, he shared with the Guardian that he had once had a morbid curiosity about how Guardians handled the final deaths of their friends until witnessing their reaction and noted that Cayde had been very popular with the residents of the Farm. He then suggested that they pour out a drink in honor of their fallen friend's memory. Devrim was fascinated by accents, including those of the Fallen. He knew enough about them to differentiate Fallen who belonged to different Houses. 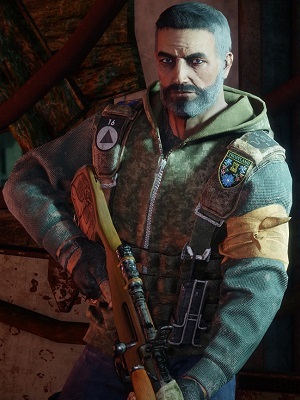 Devrim serves as the vendor and one of the main questgivers for the EDZ. He is situated in a small sniper nest in the Trostland church. Turning in EDZ tokens, Dusklight Shards and Dusklight Crystals increases player reputation with Devrim and rewards legendary faction gear, shaders and other rewards. "Hot cocoa, homemade Fuan cheese, baked clams... oh, I do miss you, Marc." "My dear Marc, I am toasty warm, I assure you. Though, uhm, you might send me more tea." "On your way, little bug. Nothing to see up here." "I can not afford to be distracted; I do hope you understand." "Put your head in my sight so that we can both take a break." "You can hear that too, right?" "One shot. One shot for every friend we've lost." "Suraya, your frequent check-ins break my concentration. Let an old man snipe in peace, will you?" Devrim Kay and Master Ives share the same voice actor, Gideon Emery. Besides Failsafe and Brother Vance, Devrim Kay is the only patrol helper that was never a Guardian. Devrim Kay's name is Turkish and could be translated to Revolution Shift. Devrim uses the No Land Beyond which is an Exotic Sniper Rifle from Destiny. Devrim will occasionally mention his partner Mark/Marc in idle conversation. This sets him as the first ever gay character in Destiny, or any other Bungie game. High-poly, untextured render of Devrim.